All our stores are equipped with a 30-metre track with integrated Footscan® technology. This allows us to perform an in-depth analysis of your foot profile and recommend the most appropriate running shoe or hiking boot. Your feet are the foundation for correct posture. Even the slightest deviation can have a major impact on your bodys stability. Runners, walkers and other athletes with a foot abnormality or pain can wear custom-made orthotics to remedy or prevent nasty injuries. Our specialised workshop has largely contributed to the current success of Runners Lab. Our experts are true craftsmen in the manufacture of dynamic orthotics and customising and personalising shoes. Runners Lab is anything but a regular specialist dealer. Using our extensive experience and passion, we select only the best technical products on the market. We believe that comprehensive service and personal contact are essential if you want to ensure every runner and walker has only the best possible experience when practising their favourite sport: injury free. Each technical running shoe, hiking boot, or sprint spike is constructed differently, according to specific needs. For example, surface, light or heavy weight, distance, past injuries, foot type and gait all play an important role. Did you know that forty percent of all running injuries are caused by wearing the wrong type of shoes? How can we ensure that you will choose your new pair of shoes based on more than only your favourite colour? Very simple. By not having them on display in our stores. Wondering how our consultants will help you find the best type of shoe for your unique foot profile? Just like during a relay race, its important you take the right relay baton with the next number. On our TV screens, you can see which number is currently being helped. 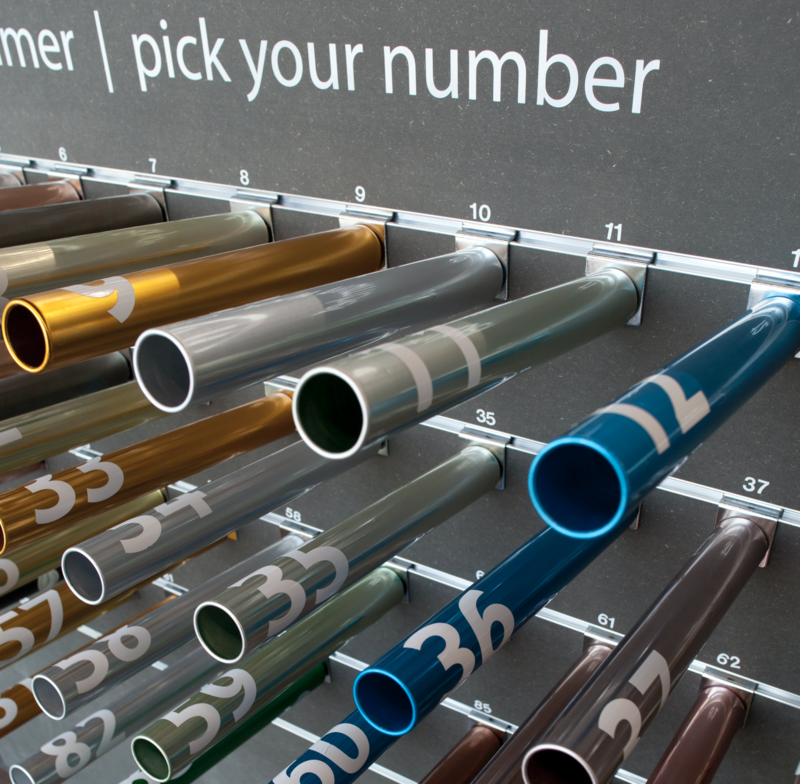 At Runners Lab, youre more than just a number. Because we attach great importance to personal contact, one of our consultants will have a one-on-one conversation with you to work out what kind of shoe you need. As a result, you may have to wait a bit. A full analysis takes around thirty minutes. To make the best use of your time while waiting, you can relax a bit and read a running magazine, or think about questions you may want to ask our consultant. After all, running is much more than just custom-measured shoes. 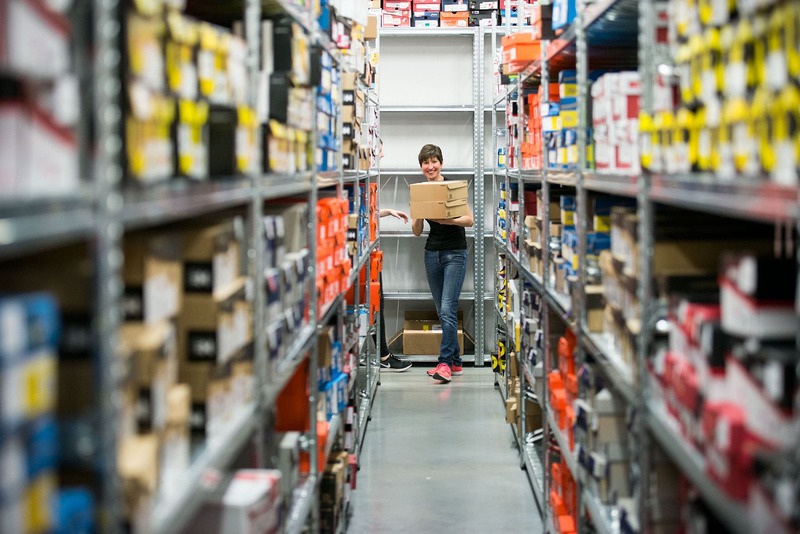 You can also take this opportunity to have a look around our shop and discover all the latest technical running gear. When its your turn, one of our Runners Lab consultants will call your name. Hi, welcome to Runners Lab. As you know, we attach great importance to personal contact and involvement. In order to paint a complete picture of you, wed like to learn a bit about you. Who are you? What are your goals, how experienced are you, are you currently suffering from any injuries or have you done in the past, what type of surface do prefer to run on, are you an experienced runner/walker, or even a professional athlete? Or maybe youve just started running and youre not sure if youre in the right place. Dont worry, youve definitely come to the right place! Our goal is to advise and inspire you the best we can to help you run, perform and enjoy yourself optimally. Okay, now we know who you are. But what we dont know yet is the unique roll-off pattern of your feet. 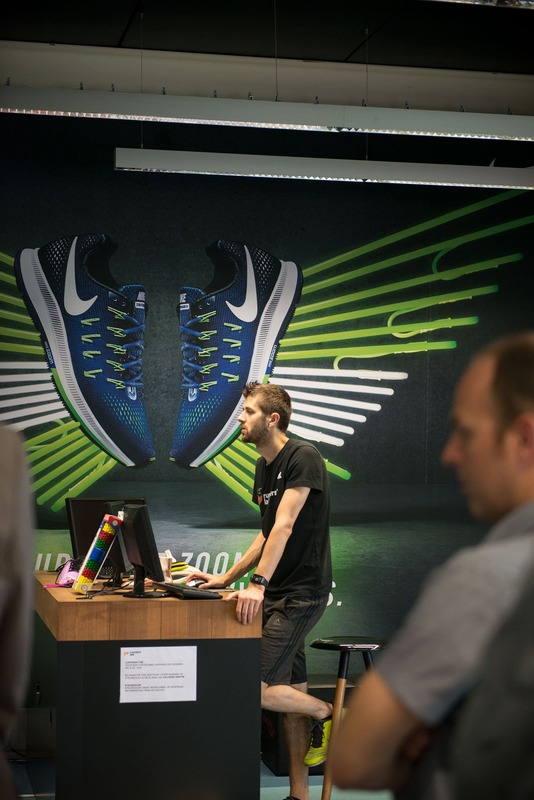 Our stores are equipped with a 30-metre test track with integrated Footscan® technology. This advanced technology records your roll-off pattern and unique foot profile using more than 500 frames per second and over 16,000 pressure sensors. The beauty of this scientific system is that our consultant can derive a wealth of information from the system. Where is the most pressure at impact, do you land on your heels, on your midfoot or forefoot, do you have fallen arches or a hollow foot, are your feet pronated or supinated, etc.? Our consultants can even deduce the risk of certain injuries (shin splints, Achilles tendon problems, knee problems, hip or back problems) from the data. Its not about what you think looks nice. Let your feet choose! Our consultant will then take your personal foot profile and get to work. Our consultant will search through the hundreds of different models we keep on stock. 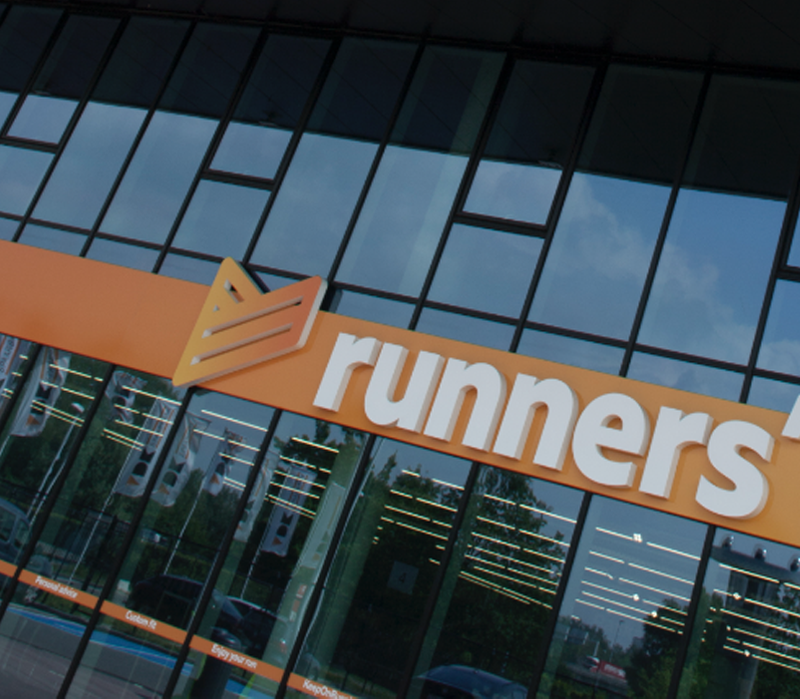 By the way, did you know that were one of the only specialist stores in Europe that carries extra wide sizes and running shoes up to size 52? Choosing the right shoe will go a long way towards preventing injuries. Whats more, good technical shoes dont necessarily have to be expensive. Our shoes vary between 120 and 180. Of all the big well-known, and smaller specialised brands, we carry only the top models, and only if they meet our stringent quality requirements. You will now get to test the various models that our consultant selected for you, one by one, on our 30-metre long test track. How do they feel? Fit and stability are very important. Together with you, our consultant will use the results from the Footscan® system to find the right shoes with the best combination of support and fit. If necessary, the insoles of your shoes will be adjusted in our workshop. This degree of personalisation allows us to absorb any asymmetries and provide your feet with extra support at specific pressure points. All of these adjustments are free of charge and included in our comprehensive service. 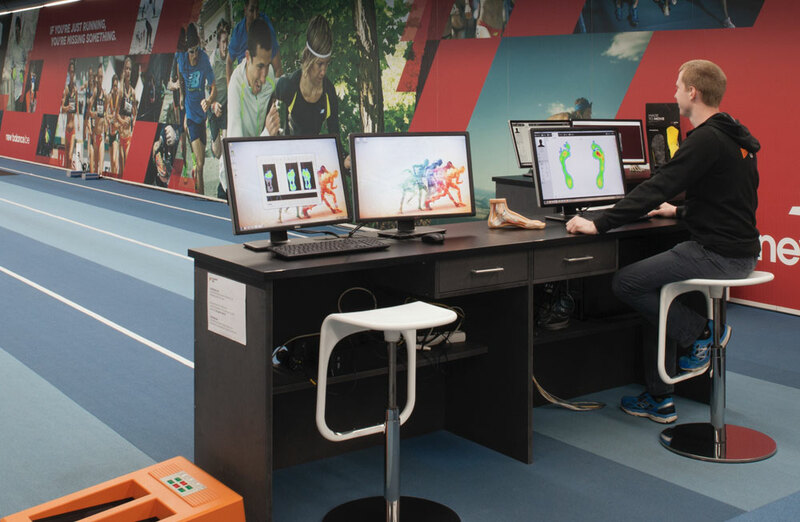 A Footscan® analysis, extensive personal advice and adjustments to the insole are COMPLETELY FREE when you buy a pair of shoes. This is because its an integral part of our comprehensive service and unique way of advising our customers. If you still need a bit of time to think after the analysis, youll be charged a small redeemable deposit of 25. You will then receive a 25 voucher that you can redeem again later. Not a bad deal! New shoes always take a bit of time to wear in. Its therefore important to gradually increase the intensity so your feet have time to get used to them. But if the shoes still dont feel comfortable after this initial wearing-in period, dont worry! Our consultants are ready to help! During this last phase of personalisation, it is sometimes just a matter of fine-tuning your insole. And if you already have a pair of good running shoes or walking shoes, but arent sure if they still offer enough cushioning or support, just pop by for a free consultation! Our consultants are ready to help you in all our stores. PLEASE NOTE: For custom insoles, you will need an appointment (see below). Your feet are literally the foundation for correct posture. Your feet endure an extreme amount of pressure and stress on a daily basis. Even a small deviation can already have a major impact and cause problems. Are you constantly overburdening yourself while running or walking? Do you suffer from sore feet or lower back pain? Do you suffer from flatfoot or hollow foot? If so, insoles tailored to your personalised foot profile might be the solution. 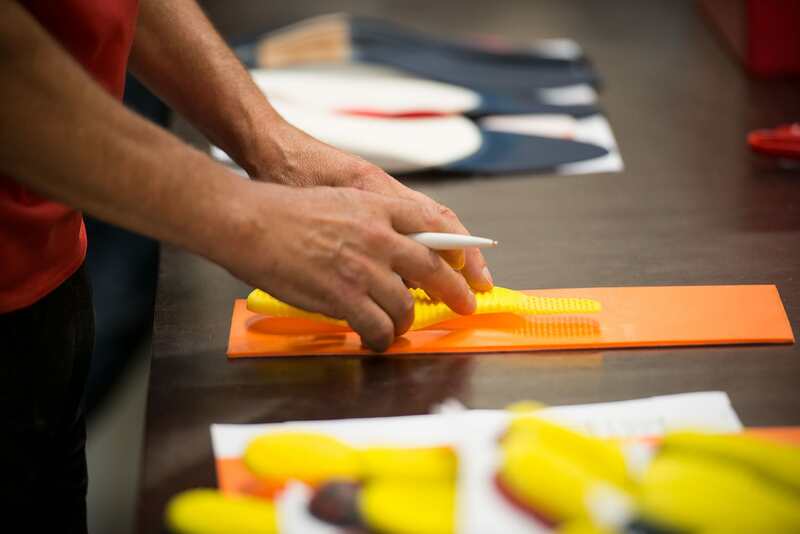 Runners Lab has all the expertise and technology in-house to provide you with custom insoles. Our dynamically-measured orthotics are manufactured by an orthopaedic technician in our own workshop in Zwijndrecht. Material choice is entirely dependent on the type of activity (sport, work shoes, or everyday use), and body weight. Our experienced podiatrists will first determine your unique foot profile using the advanced, scientific Footscan® technology. At Runners Lab, we measure our insoles dynamically, instead of statically. After all, our bodies arent static, and are designed to move. Based on your unique foot profile, body weight, complaints, needs and goals (sports, work or everyday use), you can choose between two types of insoles. Did you know that our sister company RSscan (the developer of Footscan®) actually developed Phits insoles, together with Materialise (a 3D printing expert)? 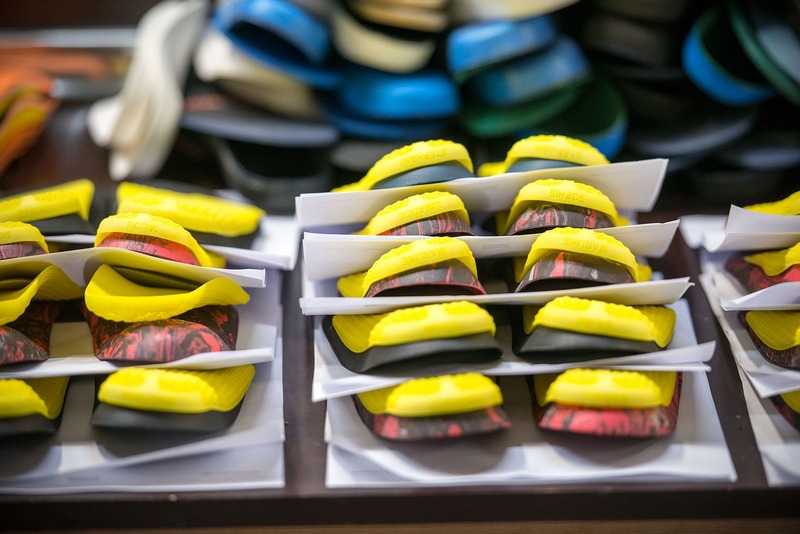 The D3D insoles are manufactured in our own workshop and the process takes a couple of days. We can also manufacture them in our flagship store in Zwijndrecht while you wait, for an additional charge of 20. Phits insoles take slightly longer to produce, at around 14 days. Please note: appointment required. Recently healthcare insurers have changed their policy regarding reimbursement of insoles. Are you affiliated with Partena? A reimbursement of 50 EUR per pair per year applies. Please inform about the terms and conditions with your healthcare insurer prior to your visit. New orthotics should be worn in gradually, so your feet have time to get used to the new support. However, if your new insoles still dont feel 100% comfortable after the initial wearing-in period of 24 weeks, dont worry! Our podiatrists are always ready to help customise them further where necessary. Personal contact is also very important when measuring insoles. Our podiatrists therefore work by appointment. In 30 minutes, they will conduct a comprehensive one-on-one conversation with you. Remember to bring along your current insoles and the shoes you will be wearing the new insoles in! Click here to make an appointment with our podiatrist. We can also help people with orthopaedic modifications and repairs or adjustments when it comes to leg length discrepancy. For athletes, we can even transform running shoes into sprint spikes. Below is a list of the various possible adjustments. Extensive training on hard spikes can sometimes result in injuries. A competition running shoe provides more support and cushioning and can be converted into running spikes in our workshop. To this end, we remove the rubber outsole on the forefoot and replace it with a spike plate. This adjustment is possible on both new and used running shoes, assuming they are still in decent condition. Worn rubber on throwing spikes can be restored by vulcanisation. This creates a new layer of rubber on the spike. We grind away six fixed studs (on multi-stud shoes) and replace them with screw threads for removable studs. This allows us to convert one pair of shoes into an all season model with optimal stability. All you need to do is adjust the removable studs to the type of terrain. To prevent the sole from coming loose it is best to attach it to the upper with additional stitches. If a person suffers from so-called Haglunds deformity (a bony enlargement on the back of the heel bone), a solid heel cap can cause irritation. To reduce pressure and friction pain, we can remove (cut away) a portion of the hard heel cap. Rubbing by the toes can cause the upper (mesh) of running shoes to tear. A leather toecap will prevent the shoe from tearing further. In running shoes the inside of the heel cap often sees a lot of wear. If this where causes irritation or friction this can be remedied by covering the inside of the heel cap with leather. In the event of a stiffened big-toe joint (Hallux rigidus) or reduced mobility of the ankle joint, a rocker bar in the shoe may provide a better heel-to-toe gait. The rocker bar is placed in the midsole of the shoe. This makes the sole a bit rounder, which facilitates a smoother heel-to-toe gait. In exceptional cases, the composition of the sole or materials used will make it technically impossible to place a rocker bar in the shoe. This refers to customising shoes for correcting leg length discrepancy and is possible in most shoes*. We skilfully slice through the midsole, elevate it using EVA, and reseal the shoe. This process has no negative impact on the shoe. *In exceptional cases it will be impossible to elevate a shoe due to the composition of the sole or materials used in its construction. Did you know that Runners Lab also has an online shop?